RESULTS COUNTING IN PROGRESS ! it shall be online not later then 1st march, subscribe to mailing list to get notified and to receive music downloads. You are very welcome to participate in our online community “Best of the year” poll ! Together let’s choose and highlight the most interesting projects, releases from last years ! We have many categories, it shall take you 5-10 minutes to fill 20-30 questions about music and more. Our goal is to promote the projects and artists that entertain our ears with their music and other type of creation. We are sure that artists will appreciate your support here. To encourage your participation, we will randomly choose 100-150 voters among the participants who will receive music downloads from our friends from Desert Trax, Merkaba Music, Microcosmos Records and more. Also 12 festival tickets will be given away among our PATRONS on Patreon and voters. 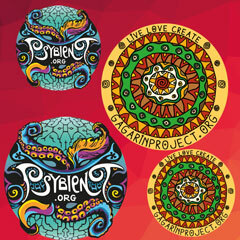 You will have selection of Psy-Fi Festival (Netherlands), Hadra Festival (France) and Harmonic Festival (France).